Most people remember diesel cars from their childhood as loud, rattling, smoky boxes which Dad took to work, disturbing our morning sleep because of the need for ‘warming up the engine’. Back then, diesel fuel was unrefined, unclean, and generally run in engines which would inefficiently burn that fuel into our nasal memories. Much of the technology of that day no longer exists and the amount of science, technology, and know-how now present in diesel engines rivals some of the greatest gasoline advancements achieved over the last 30 years. Gone are the loud engines, the glow plugs, and the unclean emissions. Welcomed are quiet, efficient, clean engines praised by high-end European car manufacturers such as Volkswagen, Audi, Porsche, BMW, and Volvo. Heavy duty diesel vehicles are also seeing a boost from cleaner, more efficient engines within companies such as Cummins, Caterpillar, and MAN. But why are the diesel engines of today cleaner, more efficient, and more cost effective than those of earlier years? A large part of the answer is surface metrology. 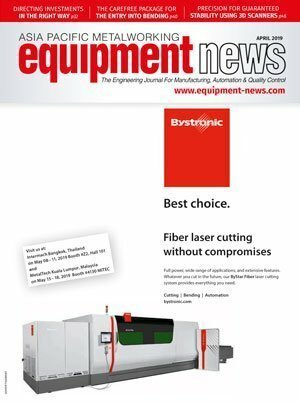 Advancements in diesel engine manufacturing have brought to the forefront new technologies in manufacturing — and the associated metrology required to create those components which maintain lowered diesel emissions and increased vehicle efficiency. Current diesel engine technology stems from a fuel delivery system consisting of a high pressure fuel pump, a pressure rail, and diesel fuel injectors. These components, collectively, comprise the Common Rail Diesel (CRD) engine. CRD engines operate at high pressures and very tight manufacturing tolerances. Components in the CRD engine are subjected to intense pressures — on the order of 32,000 psi. To put this in perspective, the pressure the diesel injectors experience is more than double the pressure found at the deepest point in the ocean. In order to operate with these intense strains, fuel pump and injector components must be manufactured to tight tolerances using special processes. These processes, typically polishing, lapping or superfinishing, can produce a surface with an average roughness (Ra) better than 25 nanometers. For reference, a typical sheet of paper is about 100,000 nanometers thick. A mirror finish is typically on the order of 100 nanometers of average roughness. To produce these parts consistently with little variation, metrology systems are needed to control the process by monitoring the effect of the manufacturing activity. For most parts, with much rougher surfaces, stylus systems can be used, which operate by contacting the surface, dragging a stylus tip across and reporting the topography of the path traced along the part. This is a very easy and quick way to characterise the roughness of the part. However, for these high pressure, high tolerance parts, stylus instrumentation is no longer adequate and will leave a scored surface which the high pressure diesel fuel can follow, causing a leak in the injector. 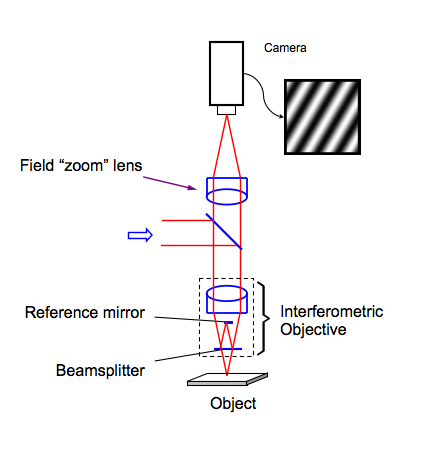 Interferometric non-contact metrology is based on the interferometric principal that two light wavefronts, when they interact, can either build or detract from the intensity of the original light source. This is very similar to when we cast stones into the local pond and watch the ripples interact. Those wave crests or troughs which interact with one another will generally add up to a large wave, while the crests and troughs which would combine will essentially cancel each other out. The principle with scanning white light interferometry is fundamentally the same. One light wavefront reflects off an extremely flat and smooth reference surface and interacts with another wavefront, which is reflecting off a sample of which we want to collect data. When these two light wavefronts combine at the camera, the user will see a series of black and white fringes. As with the water ripple analogy, these black and white fringes are the result of constructive and destructive interference of the ‘crests and troughs’ of the light, increasing or decreasing the amplitude of the light source used to illuminate the sample of interest. 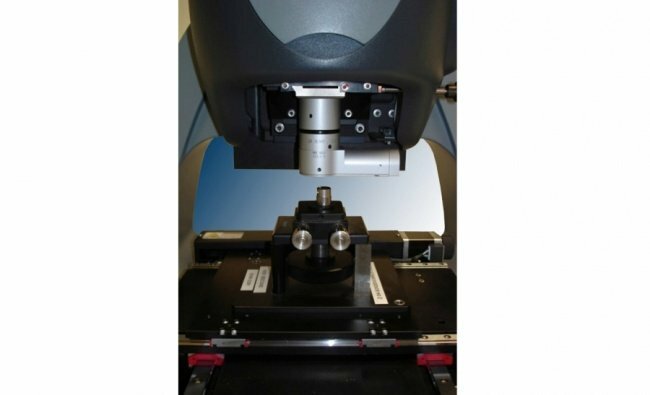 Because the high quality reference surface is fixed in position relative to a microscope objective, the instrument will scan normal to the surface, taking slices of the surface at small increments. As the instrument scans the surface, each frame of data is stored and later reconstructed in 3D, allowing the user to analyse the surface for its roughness or waviness characteristics. Some instruments are capable of a vertical resolution better than 0.1 nm, with the ability to measure step heights exceeding 10 mm. These instruments allow their users to adapt the tool to almost any application from micro-roughness to large step heights, from single field of view cone angle measurements to large area stitched flatness inspection. These capabilities were important to the diesel parts industry, as many of the seals are ring-shaped, and contain many conical slopes. For a long time, stylus contact metrology methods had been appropriate for the diesel part manufacturing industry’s rougher textured surfaces. But to transition to extremely low surface roughness parts, produced by current manufacturing processes, the metrology needed to be quicker and non-contact. Trying to solve the problem, some manufacturers used a single wavelength light source, such as a green light bulb, to measure the smooth sealing surfaces with a technique based on single wavelength interferometry. But precision was limited to an operator’s visual count of the fringes viewed through the glass; and the results introduced too much uncertainty in the measurement. This was a subjective analysis at best. Interferometric non-contact profilers are used in R&D and pre-production parts to ensure that the manufacturing processes needed to attain new, low tolerances are achievable. Without the ability to measure the surfaces repeatedly and reliably, new processes cannot be established or maintained with confidence. In order to qualify new processes, non-contact optical profilers were introduced to the manufacturers as an extremely fast, accurate, and repeatable method for objectively providing quantified results. By proving that key in-production applications had excellent results in the field; the adoption of the technology after the initial R&D and lab systems was quick. Eventually, most metrology labs replaced their contact stylus technology with the more suitable non-contact optical profiler technology. Today, non-contact surface profilers are used at diesel component manufacturing sites worldwide, providing the ability and adaptability to measure hundreds of different parts with features ranging from cone seat angles — critical to the release of well-shaped diesel fuel discharges from the injector into the combustion chamber — to the high pressure fuel pumps, where high precision sealing surface flatness and roughness is critical to maintaining the fuel’s high pressure in the common rail assembly. The inside of the CRD injector consists of sealing and clamping surfaces under immense pressure. Through piezo-crystal technology, where a material can expand and contract extremely fast when current is applied, these surfaces must maintain proper fuel flow up to 1 billion lifetime opening and closing cycles, while maintaining the manufacturer’s specified pressures. Any manufacturing failure in the form of excess surface roughness or deviation from flatness will dramatically reduce this lifetime, causing fuel leakage or complete injector failure. While maintaining proper seal flatness is important, so is maintaining proper surface roughness. Low surface roughness on sealing surfaces prevents the high pressure fuel from leaking. When the texture or waviness of the surface is not within tolerance, the diesel fuel will seek out the path of least resistance from a high pressure area to a low pressure area, resulting in the lowering of pressure at the nozzle tip. As a consequence, the injector needle either disperses the wrong amount of fuel into the combustion chamber, or leaves residual fuel in the fuel sac when the needle is closed. The outcome is incomplete combustion and poor emissions. In automotive component manufacturing, the ability to resolve issues and provide solutions quickly relies on the capability of the quality control instrument to provide fast and accurate results. With hundreds of thousands of parts made monthly, a small issue, if left unidentified, can mean scrapping thousands of parts or worse yet, a major recall. With non-contact interferometric profilometers, quick acquisition and analysis identified problems before they became major issues. The ability to measure multiple types of surfaces with different shapes, textures, and angles means the software must be robust. In addition, the capability to acquire, analyse, and process the data for roughness, waviness, and flatness is required by most automotive component manufacturers while adhering to the newer ISO 25178 standards for areal (3D) metrology. Automotive manufacturers needed unique objectives designed for everyday use at manufacturing plants. The needs were for the largest range of interferometric objectives from 0.5X to 100X, including long working (20 mm) and super long working (30 mm) distance designs, and the highest lateral resolution of 100X. 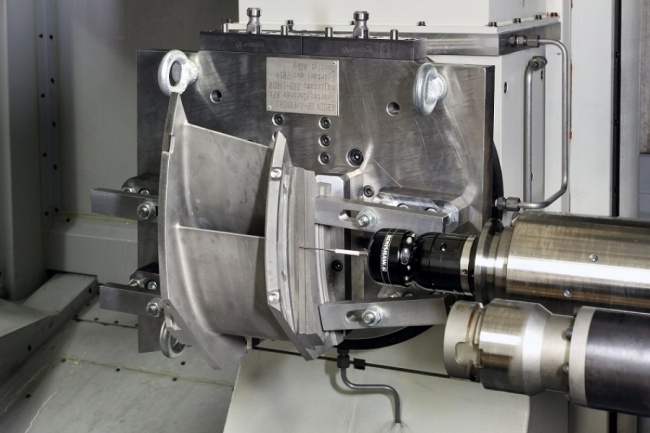 These provide users with the ability to scan and analyse data from parts which are not attainable by other non-contact methods, providing solutions for deep injector cone seats, deeply recessed pump parts, and, through the use of special techniques, the ability to measure cylinder bore texture and injector high pressure bores. An Optical Profiler in the market (Zygo NewView) has the ability to scan, in production, critical sealing surfaces to measure both the form and roughness, allowing the injector manufacturer to identify and correct any issue with the manufacturing process. Through the use of automated and programmable software and staging, each instrument can be tailored to perform one or many specific tasks on the production floor or the R&D lab. Worldwide, diesel engine emissions could have contributed more significantly to air pollution were it not for new technologies and processes applied to diesel engine components, exhaust gas filtering systems, and fuel quality. Because of the use of Ultra-Low Sulfur Diesel (ULSD), new materials contained in exhaust systems, and new manufacturing and metrology processes, modern diesel vehicle emissions have dropped tremendously. Based on the Euro Emissions standards, the amount of hydrocarbon (HC) and nitrogen oxides (NOx) emissions will have dropped 82 percent from 1997 to 2014. Particulate Matter (PM), which was the largest concern for lung health in humans, will have dropped 96.4 percent (based on the Euro 1 to Euro 6 standards; from 1997 to 2014). To put these effects into perspective, a recent study completed by researchers at the University of California Riverside, showed the amount of particulate matter from a hamburger on a commercial under-fire charbroiler produces more particulate matter than today’s average diesel truck, driving 140 miles. Due to current optical profiler technology, a ride to the local store or restaurant in your new clean and efficient diesel vehicle will, in some respects, place fewer burdens on the environment than cooking the patty in your burger. Inspection software to verify potential errors on machined parts are critical to ensuring wastage and eventually improving cost savings. By Peter Dickin, Marketing Manager, Delcam.